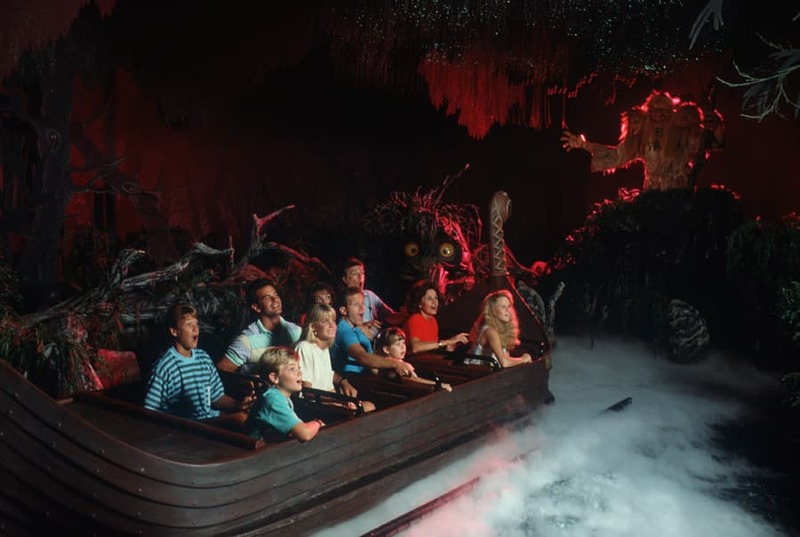 On this day back in 1988, the trolls of the Maelstrom attraction at Norway Pavilion at Epcot began shouting “Disappear! Disappear!” to guests traveling nearby. 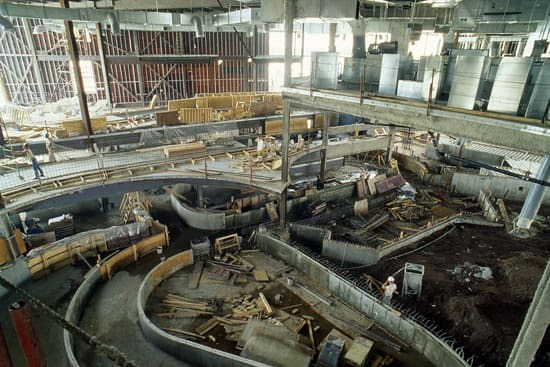 Below is a rare look into the attraction while still under construction on July 15, 1987. Although the Norway pavilion opened in May 1988, it wasn’t until July 5 when Maelstrom had its official opening. Originally called SeaVenture, as shown above in the construction photo from March 1988, the Maelstrom still takes guests on an incredible voyage through the past, present and mythological world of Norway. My siblings loved this ride so much they rode it twice! Ryan, that’s the oil rig/unloading station. The trough at the top of the picture is the maintenance track for the boats, which would put this shot at the very end of the ride. Speaking of the oil rig… whatever happened to the Tesla coil that was mounted over the oil rig to create the lightning effect? Was it ever installed? Thank you for the photos! 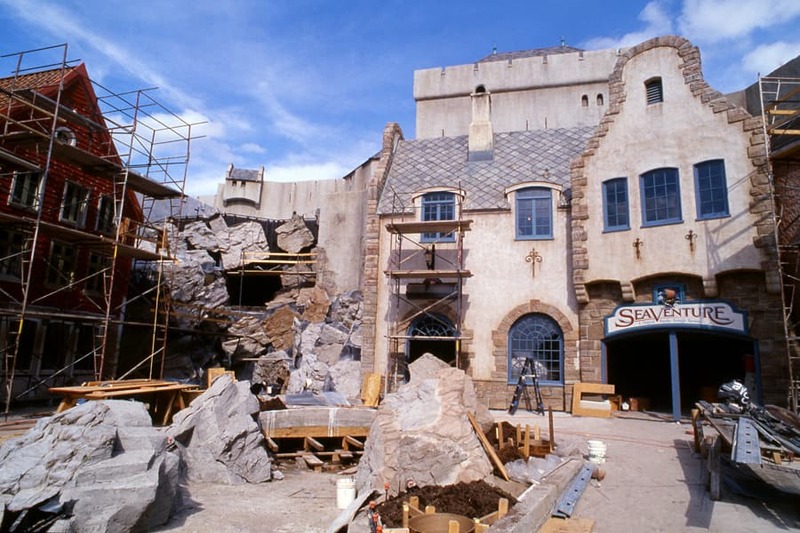 This attraction as under construction when I first visited Walt Disney World as a child and well, as someone who is partly of Norwegian heritage, we couldn’t wait to see the finished product. It took a few years, and now I’ve been back several times since, but the Maelstrrom is one of my favorite, must experience, attractions! As far as the movie goes, I absolutely love it yes… I also sit through The Spirit of Norway each & every time! Any idea what scene that is under construction? If I had to take a guess, I’d say the oil rig/unload area, but that would just be a shot in the dark. We love Maelstrom too! Thank you for sharing the look back. Love the Maelstrom although I also wish the ride was longer. I’ve always been a big fan of the fishing village where the ride ends, some great details! Would love to see a picture of that. Also must admit that we always skip the movie…. Does anyone else remember Disney offering ponchos before riding this? It opened before Splash Mountain and was WDW’s first flume with a splash (if only Pirates did so in the hot MK heat!). I could have swore when it opened there was a big deal about getting wet on a Disney ride. Or have I been hanging out with Figment and his imagination for way too long? I love this ride, and I love the whole Norway section of Epcot. I wish there was a bit more, and I also wish they had a sit down restaurant without princesses. I love the characters, but me and my Dad didn’t feel to comfortable with the idea of dining with princesses. Had it been villains maybe, or even trolls! I love the counter service meal there and would love to try the actual restaurant someday. Great ride, great place in Epcot 😀 I always make sure to get on this ride at least twice while I’m in FL. I just rode this last night!! I realize it’s not the most thrilling rides on property, but it is, by far, my favorite! No trip to Epcot is complete without a ride on Spaceship Earth and Maelstrom. I also used to love riding El Rio del Tiempo, inside the Mexico Pavillion, but after it’s 2007 renovation/renaming, I’m not so crazy about it. I hope Maelstrom is left intact! So how long was the name SeaVenture used before it changed to Malestrom? And what was the reason I’m so curious on this mystery. The name was changed before the opening of the attraction. It has always been known as Maelstrom. This is one of our favorite rides and we must ride it several times when we visit. I love seeing the process of the ride. Amazing! I personally love having the princesses next door. With all the mythology in Norway the princesses fit right in. The setting is perfect for a little princess to meet her favorite Disney princess. Not to mention, the muffins at breakfast are to die for! Absolutely this is a must do…multiple times…on each visit. I think my favorite part is the polar bear. Sure, he may want to eat us, but seeing him is like seeing an old friend. I hope they never change his roar. I look forward to that every trip. What I also like is how cool it is on the ride, which makes it fantastic on a hot day. The more making-of pictures, the better. I love them! Now…who are these princesses being talked about? My Dad loves the movie at the end too. We always stay to watch. Definitely one of my favorite Epcot attractions. Plus, once you exit, make a quick right, and grab some School Bread from Kringla! I didn’t realize they actually got as far as making and installing a sign for SeaVenture before changing the name. What prompted them to change it at that late date? I’m still unsure. I asked around, but nobody really had an official answer for me. Those making off pictures are amazing. I love this attraction and I wish it was a bit longer. I also love the food in this country.